"This is truly and ridiculously easy. The trick is to get the grill grates very hot. And the result? A lightly caramelized surface and a slightly smoky flavor. The insides stay cool and crisp. It's quite a contrast of tastes and textures." Brush each romaine lettuce half with 1/2 teaspoon olive oil. 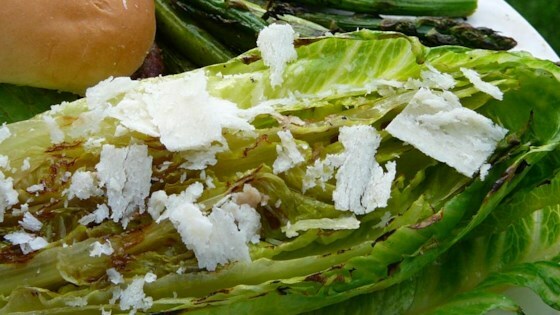 Cook romaine hearts, cut-side down, on the preheated grill until the cut-side is slightly caramelized but the inside is still cool and crisp, about 2 minutes. Transfer lettuce, cut-side up, to a platter. Sprinkle Parmigiano-Reggiano cheese over lettuce and drizzle balsamic vinegar, sherry vinegar, and 2 tablespoons olive oil over the top. I will be making this all summer long! Had it last week at a restaurant with goat cheese so I used that instead of parm. Do try, you will not be disappointed! Delicious!!! So easy to make and taste amazing. I followed the recipe exactly but added some croutons for crunch. This was a great recipe. A wonderful change from salad and a great way to add some greens to the kids diet. Thanks for sharing! LOVE this recipe! Easy, quick, and delicious. Followed the recipe just as written. Oh my gosh!!! Super cool to serve to guests and so delicious!!!! Thank you!! !